Earlier this week, the BBA Environmental Law Section hosted its review of Energy and Environmental laws proposed during the 2013-14 legislative session. 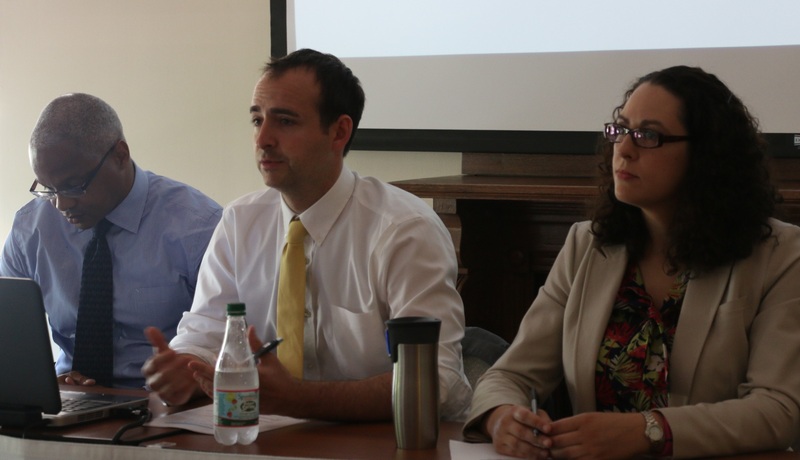 The discussion featured three speakers with a wealth of experience in environmental law. Dan Burgess, Deputy Commissioner of the Department of Energy Resources, Gary Davis Jr., General Counsel of the Massachusetts Executive Office of Energy and Environmental Affairs and Erica Mattison, Legislative Director of the Environmental League of Massachusetts provided brief reviews of a number of complex bills. H4164 – Following a 2013 study ordered by Senator Markey on gas leakages and based on the fact that Massachusetts has one of the oldest pipeline systems in the country, this bill lays the groundwork for expediting much needed repairs and updates to the natural gas pipe system. The bill has been enacted in the House and the Senate. S1970 – This bill creates incentives promoting the use of thermal energy. It was reported favorably out of the Joint Committee on Telecommunications, Utilities and Energy and has passed the Senate. S177 – This bill provides solutions geared towards encouraging large commercial enterprises to engage in major energy efficiency overhauls, namely by offering these enterprises more and improved financing options by leveraging their property. This bill is before the Senate Committee on Ways and Means. H3901 (but soon to be re-numbered) – As the state’s solar energy usage has greatly expanded in recent years, it has revealed some issues regarding net metering, the system by which solar energy customers can generate their own electricity for credits that they can then use to lower their electricity costs. This bill is a combination of four previously drafted bills on the issue and seeks to offer greater fiscal certainty for solar users. It is currently before the House Committee on Ways and Means. H3968 –While dense in content, this bill’s general goal is to provide developers with a clear pathway to work on clean energy projects in order to meet the Commonwealth’s greenhouse gas reduction targets and energy reliance goals. This bill prompted the most discussion as practitioners were concerned about whether and how its language would accomplish its stated goals. It was recently reported out by the Joint Committee on Telecommunications, Utilities and Energy. H4150 – This environmental bond package allows the state to borrow funds to finance capital funding for Environmental and Energy Affairs agencies. These investments complement built infrastructure with natural assets such as floodplains and barrier beaches, support scientific research that helps the state better understand environmental issues, and provide a return on investment in clean water and air. S2021 – This bill attempts to improve drinking water and wastewater infrastructure through, most notably, increased funding, establishment of guidelines for water management, and allowing for “water banking,” a local option for cities and town to impose additional charges to fund mitigation measures for increased water withdrawals. It passed the Senate in March and is currently before the House Committee on Ways and Means. H4065 – This bill reforms the state’s outdated zoning laws. It encourages prompt and predictable permitting, establishes useful criteria for variances, promotes coordination among municipalities, encourages compact development and land preservation, streamlines the appeals process, and creates a rational system for impact fees. It is currently before the House Committee on Ways and Means. In addition to all the bills discussed, the Environmental League of Massachusetts introduced its sustainable water initiative, Brownfields plan, and budget campaign, with the goal of securing 1% of the state budget for the environment. In all it was a highly informative meeting and, as the list of bills summarized here demonstrates, it looks to be an exciting and active end of session for environmental law in the Commonwealth.